Welcome to the worlds greatest guide to Women's Cotton Jeans. Are you eager to further expand your knowledge about women's cotton jeans? Well, we hope you are because the reality is that you have found our page on the subject. 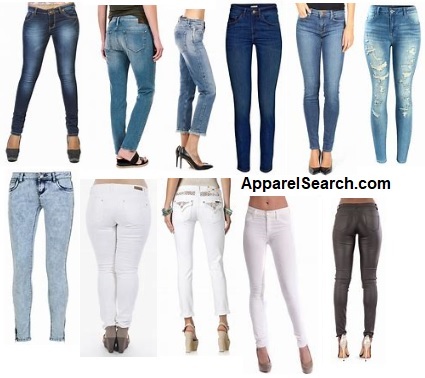 In this women's clothing section of the Apparel Search directory, you will find all sorts of interesting information regarding cotton jeans for ladies. Mentioning cotton jeans is actually a bit redundant because all jeans are made of cotton. Jeans are essentially sturdy trousers made of denim or other cotton fabric. Dungaree is an earlier term for denim. This is why some people refer to this type of pant as dungarees. This type of pant is primarily worn as informal wear. Denim is a sturdy cotton warp-faced textile in which the weft passes under two or more warp threads. This twill weaving produces a diagonal ribbing that distinguishes it from cotton duck. The most common denim is indigo denim, in which the warp thread is dyed, while the weft thread is left white. As a result of the warp-faced twill weaving, one side of the textile is dominated by the blue warp threads and the other side is dominated by the white weft threads. This causes blue jeans to be white on the inside. Dungaree fabric is a historical term for an Indian coarse thick 2/2 twill-weave cotton cloth, often colored blue. Originating in India, it was known as Dungaree, before coming to be known as denim. The term jeans appears first in 1795, when a Swiss banker by the name Jean-Gabriel Eynard and his brother Jacques went to Genoa and both were soon heading a flourishing commercial concern. In 1800 Massena's troops entered the town and Jean-Gabriel was entrusted with their supply. In particular he furnished them with uniforms cut from blue cloth called "bleu de Genes" whence later derives the famous garment known worldwide as "blue jeans". One of the worlds leading denim jean suppliers & innovators is Levi's. Learn the history of Levi's jeans for women. You should visit our fashion influence section to learn more about cotton jeans. From that section you can research the following categories and more. You may also want to read blog posts about jeans on the fashion blog. Every chic casual outfit deserves a versatile pair of jeans. From cropped skinny jeans and colored denim jeans to printed jeans and bootcut jeans, you’ll discover an incredible variety of options to coordinate with all your favorite tops if you shop your favorite retailers. Whether it’s a simple tee or an elegant blouse, it will look great with a nice pair of denim pants. What are the most common types of pants on the planet? Not sure, maybe jeans. Now that you are a fashion genius and no so much about denim, you may want to learn about different types of pants.